Sindoor Khela 2018: Durga Puja is the biggest festival for Bengalis who wait all year long for the five days of festivities. Vijaya Dashami, being the last day of the festival, is hence a sombre occasion when Goddess Durga is bid adieu for a year. Even though it’s a day when people feel sad, and emotional scenes can be seen at most of the pandals, there is a special group of people who religiously wait for the day. It’s the womenfolk. After ‘ghat visarjan’, a symbolic immersion of Durga declaring the end of the Puja rituals, women apply sindur, or vermillion, on the forehead and the feet of the Goddess and offer sweets to her. 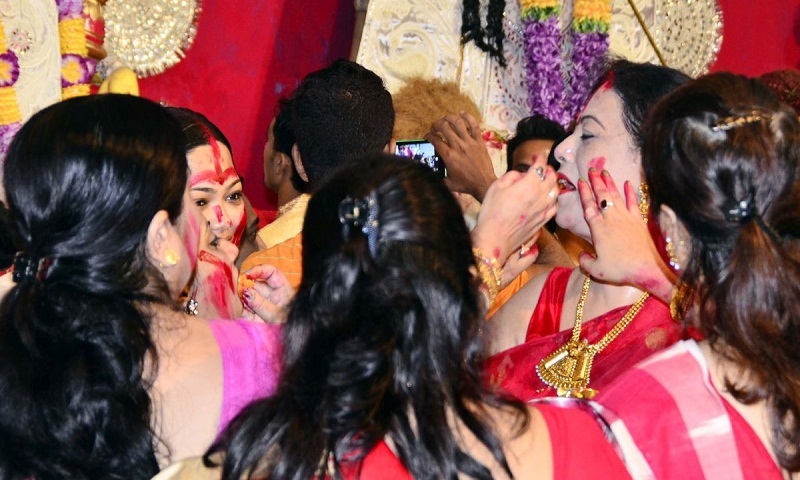 After that begins Sindoor Khela, when they apply sindoor on the feet of the older women among them and then playfully smear sindoor on each other’s faces. This year, Vijaya Dashami is being observed on October 19. What is Sindoor Khela/Sindur Khela? Sindoor Khela, or Sindur Khela, literally means ‘vermillion game’, and is celebrated by Bengali Hindu women. Traditionally, this ritual is meant for married women who are supposed to follow a set custom and protocol while playing Sindoor Khela, believing this will bring good luck for them and long life for their husbands. The ritual of Sindoor Khela begins after the Visarjan Puja on Vijaya Dashami, the last day of the Durga Puja festival. As part of the ritual, Bengali women, usually dressed in white saris with red borders, first perform Devi Baran, bidding farewell to the Goddess. One by one, they perform an arati and apply sindoor on the forehead and feet of the Goddess. Once Devi Baran is done, they apply sindoor on each other’s forehead and the parting of their hair, followed by shankha, pola and noa (three bangles, made of conch shells, coral and iron, respectively, that signify Bengali women’s marital status). They are also supposed to apply sindoor on the feet of the older women among them. Next, they playfully and carefully smear sindoor on each other faces. Finally, they pick sweets from their respective baskets of prasad and offer it to each other. While it cannot be said when and where did the Sindoor Khela tradition actually originate, many believe the tradition is as old as the festival of Durga Puja itself, which dates back around 400 years. Some, however, believe the tradition started around 200 years ago from the households of landlords (zamindars) who organised Durga Puja at their homes. The ritual created an atmosphere of bonhomie among the womenfolk on the lines of Holi, the festival of colours. While the ritual has always been considered beautiful and pious, it always had a negative aspect to it, though not much has been said openly about it. Sindoor Khela was never inclusive. This ritual has always been meant only for women with a living husband. Young girls, women who never married, and widows are not supposed to be part of this celebration of matrimony and sisterhood. The age-old tradition has started witnessing a change now. In Kolkata and other places, many pandals have started inviting all women, irrespective of their marital status, to be part of the celebrations.